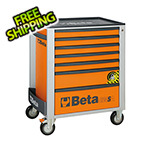 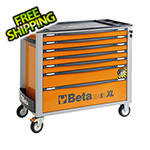 This rolling base cabinet / workstation from Beta Tools features seven locking drawers on ball-bearing slides that are complemented by two generous shelves on one end, a bottle shelf on the other end, and two bottle shelves on the back side. 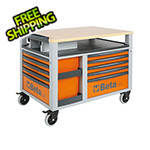 The plywood worktop is pre-drilled for mounting a vise (sold separately), and a paper towel roll holder rounds out this package. 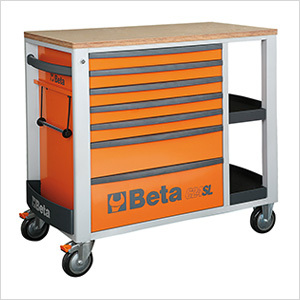 Everything rolls easily on 5" diameter casters (2 fixed and 2 swivel with brakes).